NEW YORK (CNNfn) - Microsoft has put the finishing touches on its newest PC operating system, called Windows XP, and is getting ready to put the new software into full production. We had an opportunity to test drive an evaluation copy of Windows XP Professional, scheduled for official release on Oct. 25, and were impressed by improvements in its user friendliness, stability, speed and performance. At the same time, we were a little bit concerned about its lack of compatibility with some software that has been developed specifically for earlier versions of Windows and won't work with Windows XP. But on balance, the improvements outweighed the compatibility issues, many of which are likely to be further addressed in the weeks ahead. Our test system was a Compaq Deskpro sporting an Intel Pentium II processor operating at 397 megahertz and 256 megabytes of memory. Microsoft recommends Windows XP be used on PCs with a 300-MHz or faster processor and at least 128 MB of memory. What we noticed first were substantial changes to the graphical user interface, which is techno-speak for the collection of icons, pull-down menus, dialogue boxes and other elements that humans use to interact with computers. A revamped start menu, seen here, is one of many new graphical elements in Windows XP. Windows XP looks a lot different than its predecessors. The desktop icons are noticeably clearer and more colorful. The graphical elements also have a more three-dimensional look, which is a little bit easier on the eyes. The start menu, accessed by clicking on the word "start" at the left side of the task bar at the bottom of the screen, has been overhauled as well. Windows XP keeps track of the programs you use most and lists them, as well as your choice of a Web browser and e-mail program, in a column on the left side of the start menu. Links to user directories and system utilities for things like file searching and online help are listed in a column on the right. A listing of all programs also is available on the start menu, as are options to shut down or log off of the computer. Microsoft also has simplified the way users manage and manipulate files. All the windows in the operating system's "Windows Explorer" and "My Computer" file management utilities as well as the system "Control Panel" display a list of tasks that can be performed on the types of files displayed. For example, when you open a file folder containing digital image files, you are presented with options to view the images as a slide show, upload them to a photofinisher and order prints, or print them out locally. What's more, thumbnail images of all the images in the folder are displayed on the screen, making it much easier to know what's in your image library. The idea behind the focus on tasks was to bring out Windows' capabilities � which in previous versions had been hidden behind right-click menus or nested menu options � and make them easier for computer novices to use. Of course, some advanced users may find this new scheme cluttered and cumbersome. If that's you, the features can easily be switched off. In fact, all of Windows XP's graphical enhancements, including the start menu, can be configured to appear in the "Windows classic" look. But the real improvements in Windows XP are invisible to the naked eye. It was built on an entirely new "kernel," which refers to the essential center, or foundation, of a computer operating system which provides basic services to all its other parts. Windows XP replaces the notoriously unstable DOS foundation, which dates back to the earliest days of personal computing, with the much more stable platform of Windows NT and 2000, which were designed for and are used mostly by businesses. The end result: far fewer system crashes and lockups than Windows 95, 98 and ME. During our first week using Windows XP, we experienced none of the "blue screens of death" alerting us to things like "fatal exceptions" and "catastrophic errors" that are commonplace among its predecessors. Although we did not run any benchmark tests to measure this, applications seemed to run faster under Windows XP than they do on similarly configured, or even more powerful, systems running Windows 95 or 98. The speed difference was especially noticeable on memory-intensive programs such as Microsoft Word, which frequently has an annoying lag at startup. On our test system, there was almost no lag at all. Windows XP also offers many of the more advanced networking features that historically had been found only in Windows NT, as well as features that enable multiple user accounts on a single PC. Improvements in networking also include a "network setup wizard," which automates and simplifies the complex and often frustrating process of setting up a home or small-office network. Will all my applications work with Windows XP? While completely replacing the foundation upon which it was built has resulted in a more stable and robust operating system, it also has presented a problem with some software applications that have been optimized to work with prior versions of Windows. Applications designed for earlier versions of Windows can be configured for use under Windows XP with the program compatibility wizard. To address this, Microsoft has integrated application compatibility technologies into Windows XP. Through a feature called "compatibility mode," Windows XP can run applications that have been developed specifically for Windows 95, 98, NT and 2000. Microsoft said the final version of Windows XP will ship with software "shims," which identify known problems with applications and configure them to work without any intervention by the user. Essentially, the compatibility technologies in Windows XP fool older applications into thinking that they're running on a different operating system. 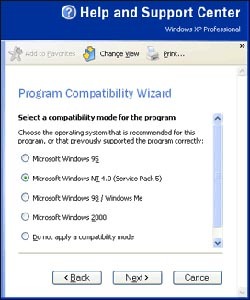 For those legacy programs that Windows XP does not automatically adjust, there is a "program compatibility wizard" on board that walks users through the steps required to set them up so they work properly. More experienced users and system administrators can make the adjustments manually. Most of the software we installed on our test system took hold without a hitch. For those applications that did not cooperate, most could be coerced using the compatibility wizard. Applications running in compatibility mode operate a little more slowly than they would under the operating systems for which they originally were developed. But not all software, including some newer applications, will work under Windows XP. For example, when we tried to install Norton System Works 2001, a popular set of system utilities which Symantec introduced only about a year ago, Windows XP halted the installation program and alerted us to a "known compatibility issue." Symantec said it is aware of the issue and will soon release a new version of the software that works with Windows XP. In fact, Microsoft recommends that users not use Windows XP's program compatibility tools on software such as system utilities, virus detection programs, and data-backup utilities because they work so closely with the kernel of the operating system. Most of the vendors that supply such software are expected to have either new Windows XP-compatible versions, or make patches available for download in time the new operating system's release. Some older DOS-based games and applications may cause problems as well. But the majority of current software should make the migration to Windows XP relatively smoothly, making it a worthwhile upgrade for most users.